CORPUS CHRISTI, TX – Team up now and get in the game! 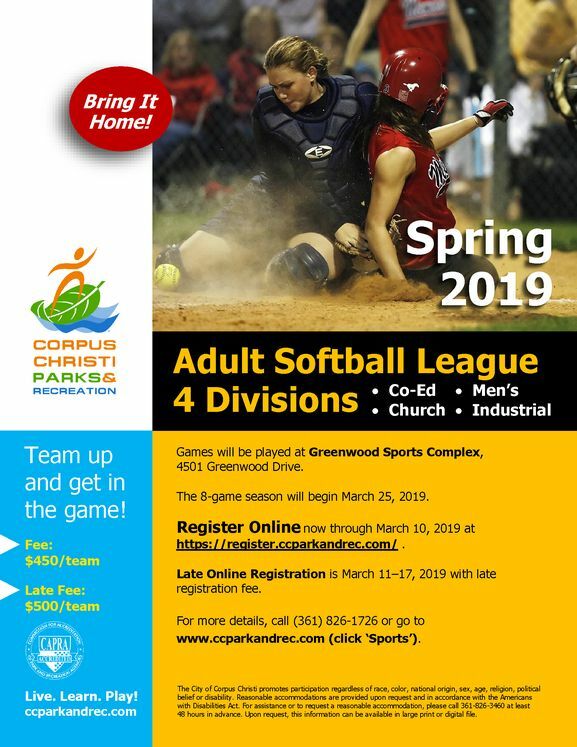 The Corpus Christi Parks & Recreation Department will offer its Spring 2019 Adult Softball League from March 25 through the week of May 23, 2019. All games for this eight-game season will be played at the Greenwood Softball Complex, located at 4501 Greenwood Drive. Co-Ed Division League games for men and women will be held on Mondays. Church Division League games for local church teams will be held on Mondays. Men’s Division League games will be held on Thursdays. Industrial Division League games for men will be held on Thursdays. REGISTER ONLINE at https://register.ccparkandrec.com/ now through March 10, 2019, for $450/team. LATE ONLINE REGISTRATION will be offered March 11-17, 2019 with the late fee of $500/team. For more information, call (361) 826-1726 or visit www.ccparkandrec.com (SPORTS).